The Stoney Creek Northstar condominiums are centrally located within Whistler’s North Village and feature a great common pool and hot tub area and complimentary underground parking. Its great location definitely makes Stoney Creek Northstar as popular as it is as guests will enjoy the easy access to both gondolas, Whistler’s Marketplace shopping area, the 2010 Olympic Celebration Plaza and the cobblestone Village Stroll. Stoney Creek Northstar #49 is a ground floor, 650 sq/ft condominium located at the rear of the complex. Upon entering, there is a tiled mudroom with a bench, closet and a washer dryer. The bathroom houses a large jetted tub and the bedroom has a comfortable Queen sized bed with a Queen sofabed in the living area making this property suitable for up to 4 guests. 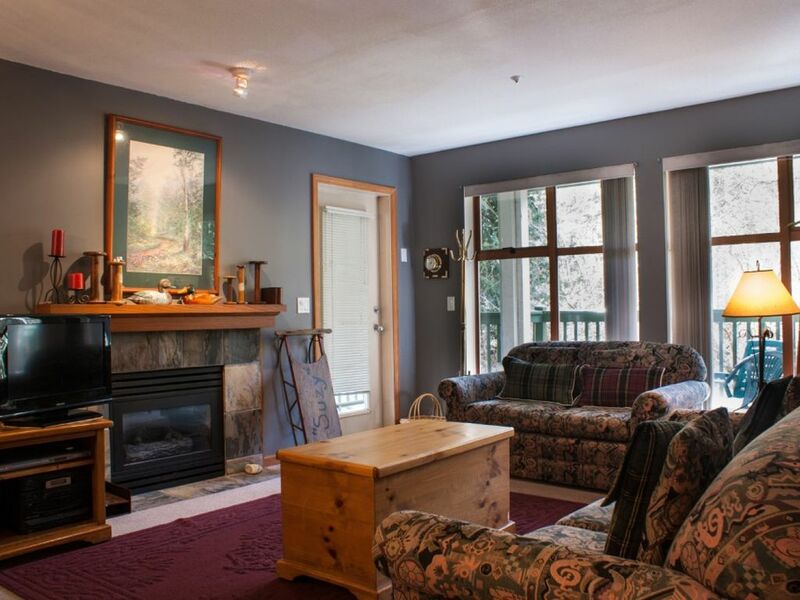 The spacious living room has a gas fireplace, flatscreen television with DVD player and access to a large wrap-around patio with patio furniture. The property’s full kitchen comes fully equipped and has a range, microwave, fridge/freezer and dishwasher. Overall Stoney Creek Northstar is a perfect combination of building amenities and convenient location making for a fabulous Whistler holiday. This property is professionally managed with 24/7 in-resort guest support. It includes free wireless internet, a digital cable television package and free underground parking.